Hens and handbags. Some Skye basket history. 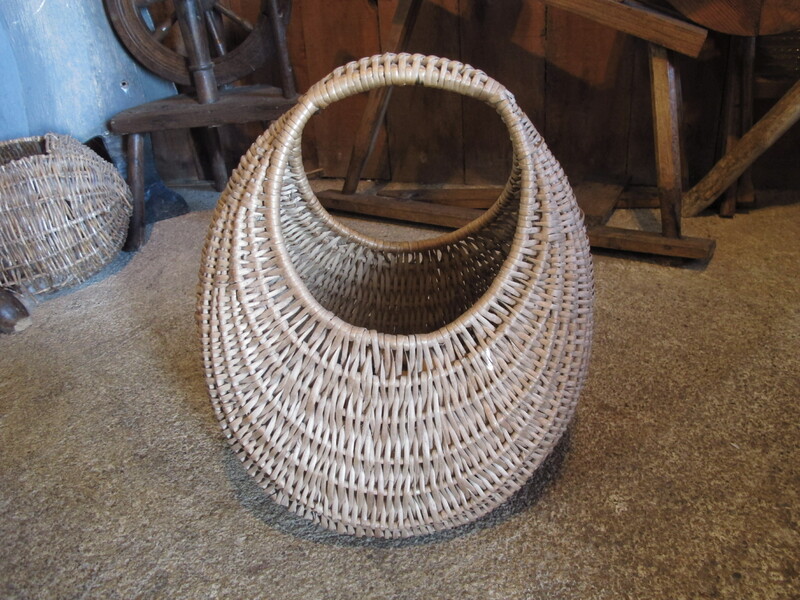 This design of basket appears to have been used for many centuries. There is some evidence that it originated here in Scotland. Scots emigrants to the Appalachian Mountains of Virginia took the design with them, adapting it to the locally available split wood. Some claim that it was originally a Viking design brought to Scotland. However in Scandinavia these baskets are referred to as ‘Scotch baskets’ which suggests the influence went the other way. However Dorothy Wright has researched images of these baskets in manuscript, tapestries and stained-glass. She has found them in fourteen illuminated manuscripts from the twelfth century onwards. They are used in the depiction of St. Joachim and the basket in his arms has inside it the sacrificial doves at the Presentation of Our Lord in the Temple. The Opus Anglicanum embroideries of 1315 show the basket being used in the same role and again in a stained-glass window in York Minster. She suggests that the baskets origins are more Celtic than specifically Scottish. There is a widespread tradition of it being called a hen basket because it was used to carry a broody hen from one croft to another. Once a hen was inside she couldn’t move her wings and so couldn’t get out. Maybe this is connected to it being used to carry birds in the distant past. Basketmakers at Kilmuir in Skye made these baskets and one of theirs appeared in the Living Traditions exhibition in Edinburgh in 1951. Another use for the basket in a bigger and heavier version was as a builder’s basket, where they were used to transport stones on simple winches. There are twelfth century references to this use in England. It was after the Edinburgh exhibition that this basket became very fashionable. It was very popular in the fifties and sixties for women to use as handbags after Brigitte Bardot started using one. Catherine Murphy remembers her aunts in Glasgow using them in the 1960s. It was made in vast numbers all over Britain. It was also copied in bulk in China, Japan, Poland and Czechoslovakia. Firstly it was made in willow, then rattan and finally in a plastic ‘rope’. It came to be called the Brigitte Bardot basket!